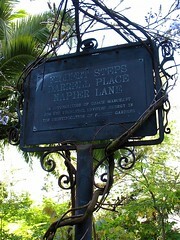 This morning, my coworker Ed invited me to go with him up the Filbert Steps on Telegraph Hill (San Francisco), which is just 2 blocks away from my work. So at lunchtime, we started our trek, well equiped with our cameras. 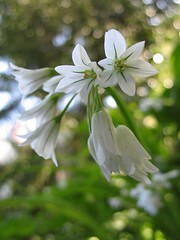 I was amazed at the beauty of the gardens along the steps. The homeowners there must have buku bucks, because those propeties have such a lovely view. We eventually ended up at the Coit Tower atop Telegraph Hill. 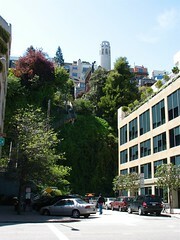 I didn't realize how close Coit Tower is to my work. Click on any of the following photos to view my flickr photo set entitled "Filbert Steps, San Francisco (April 2006)" containing 26 photos. These are beautiful pictures. I love the lady bug, the pipe and of course the albutilon 'nabob' because I have one. You have a really good eye. Great pictures. I really need to get to San Fransisco. 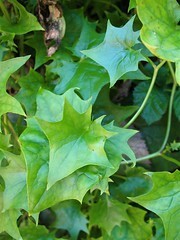 Arrowhead shaped leaves - This is an Ipomoea, a genus to which both Morning Glories and Sweet Potatoes belong. I love that hike and subsequent view. I wish I had that much money for my garden! Yup, it was a nice hike... although, I think I'm out of shape and my legs were sore the next day. I wish someone would beautify all the stairs around here! I did notice a "For Rent" sign on that hike, and I was thinking that the rent would be really high.